SONG FROM THE UPROAR is a new multimedia opera inspired by the life of Swiss adventurer Isabelle Eberhardt, composed by Missy Mazzoli. 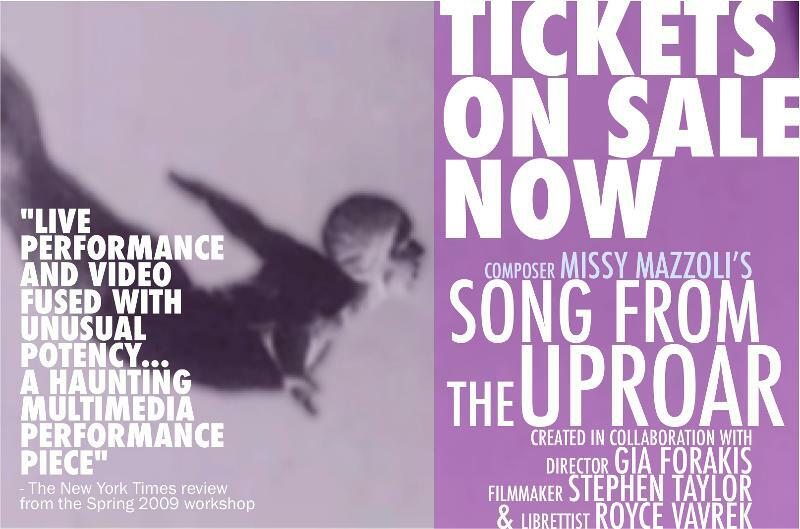 SONG FROM THE UPROAR features mezzo-soprano Abigail Fischer as Isabelle, and includes a libretto by Royce Vavrek, video by Stephen Taylor, and stage direction by Gia Forakis. *As you see this is a very limited run but I am told that this is a “long” run for a new opera !! I have been developing this opera for the last 3 years after our critically acclaimed chamber production in Spring 2009 at the Galapagos Art Center. I do hope you will be in attendance Please reserve your tickets in advance! SONG FROM THE UPROAR is supported by a grant from The MAP Fund, a program of Creative Capital supported by the Doris Duke Charitable Foundation and The Andrew W. Mellon Foundation. Commissioned in part by Linda and Stuart Nelson with additional commissioning funds from the Mayer-Ahearn Family Charitable Fund. This entry was posted on Monday, January 16th, 2012 at 6:37 pm	and is filed under Uncategorized. You can follow any responses to this entry through the RSS 2.0 feed. Both comments and pings are currently closed.